Hepworth Timber Work can supply and build a wide range of garden structures to suit our customers needs. From the ‘basic’ shed for housing bikes and garden tools, to bespoke garden rooms to add an extra dimension to your living space and everything in between. At Hepworth Timber Work we specialise in all Garden Rooms, start to finish. These are all built to our customers exact requirements and are totally unique to them. These can be fully insulated, have an electrical supply installed, have windows and doors installed or be left partially open depending upon your individual requirements. In fact the only limitation is your imagination. Whether it is a home office, an extra living space or a children’s play room we are here to advise and help. From your original idea through design and planning and onto implementation we are with you every step of the way. 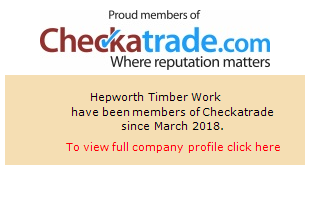 In the first instance Hepworth Timber Work would carry out a site survey at your home, and have a meeting with yourself to fully understand your ideas and requirements. This would help us to understand and prepare a basic premise plan offering our suggestions to help. After presenting this plan to you to get your further thoughts and ideas a finalised complete 3D plan and estimate costing would be provided. Once the work is agreed a start date and time frame for the works would be agreed and work would commence. The foundation work would be completed first, followed with a treated C24 graded treated timber framework being installed for the floor, walls and roof. The floor insulation would then be fitted according to your specified choice, the floorboards would be installed and the structure would then be ‘house wrapped’ with a breathable water proof membrane where appropriate and the roof installed. An electrical ring main and lighting circuit would then be installed complete with any extras such as air conditioning, internet and TV points. Doors and windows would be installed, and then the structure would be clad in your chosen material. Insulation would be installed to the walls and ceiling, and the room would be plaster boarded. The room would then be plaster skimmed in preparation for decorating. Finally the room would be decorated to your specification, any flooring and skirting board would be installed and, after a final tidy and clean, your new bespoke garden room would be handed over for you to enjoy! The advantage we have over many of our competitors is every single building we design and construct is a beautiful bespoke structure – no two are the same. From doors and windows to cladding, from decoration to flooring every aspect is unique, chosen by you, and constructed and finished with the highest attention to detail. Unlike many of our competitors all of our structures are built on site, not in a factory and then split and reassembled in situ. Working in this way, talking directly to our customers, building in front of them, means we are able to make any adjustments or changes that may arise once construction has started. It can be quite difficult to visualise a structure before building it, and working in this way ensures every customer gets exactly what they want. It allows you to have complete trust in our construction process and affords you the luxury of being able to make any changes or amendments. All garden structures are compliant with the latest building regulations where applicable, and all electrical work is completed by a fully qualified electrician with all relevant certification being supplied upon completion. We are fully insured and all of our estimates are free and non obligatory. So if you are after a get away for yourself, an office at home but away from any distraction, or a room for the children to play we have the solution for you. Whatever your idea, we’ll help you achieve it.